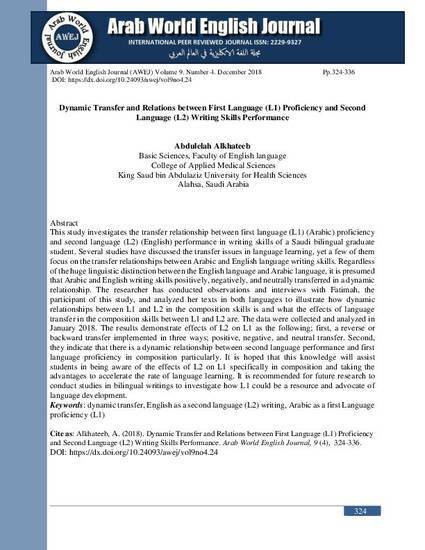 This study investigates the transfer relationship between first language (L1) (Arabic) proficiency and second language (L2) (English) performance in writing skills of a Saudi bilingual graduate student. Several studies have discussed the transfer issues in language learning, yet a few of them focus on the transfer relationships between Arabic and English language writing skills. Regardless of the huge linguistic distinction between the English language and Arabic language, it is presumed that Arabic and English writing skills positively, negatively, and neutrally transferred in a dynamic relationship. The researcher has conducted observations and interviews with Fatimah, the participant of this study, and analyzed her texts in both languages to illustrate how dynamic relationships between L1 and L2 in the composition skills is and what the effects of language transfer in the composition skills between L1 and L2 are. The data were collected and analyzed in January 2018. The results demonstrate effects of L2 on L1 as the following; first, a reverse or backward transfer implemented in three ways; positive, negative, and neutral transfer. Second, they indicate that there is a dynamic relationship between second language performance and first language proficiency in composition particularly.  It is hoped that this knowledge will assist students in being aware of the effects of L2 on L1 specifically in composition and taking the advantages to accelerate the rate of language learning. It is recommended for future research to conduct studies in bilingual writings to investigate how L1 could be a resource and advocate of language development.